Buy light dimmers in all styles and colors for updating your lighting. Find universal LED, CFL, slide, toggle, rotary knob, or rocker dimming switch controls by Lutron, Leviton, Pass & Seymour, and GE. Lighting controllers come in a range of styles and colors, so how do you find which type works best for you? See the styles below, or for vintage dimmers, see Vintage Dimmer Knob Replacement Options with photos of many older styles. Slider controls have a bar that can be pushed up or down for adjusting lighting brightness. 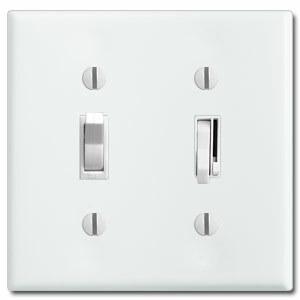 Their rectangular shape has the advantage of fitting into any standard block or Decora switch plate opening. Depending upon the model, these decorator sliders also may have a button that allows you to flip the light on to the level you previously set with the sliding bar. 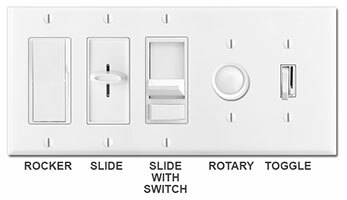 Some look like regular rocker switches but actually have a small lever on the side that can be set to a desired lighting level. These devices are convenient for lights that must be kept a lower level, whether because the lighting is too bright or harsh at full brightness, or in high-use locations where you wish to save money. 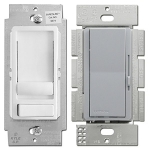 A great choice when you simply want to replace a toggle in your current wallplate cover, toggle light dimmers are compact and easy to use. They fit into regular toggle light switch covers. Depending on the brand you either use the handle itself to adjust the lighting intensity or set a small bar on the side to the desired level then simply turn the light on and off like normal. 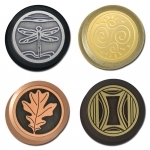 This style allows it to fit right in with your other toggles for a neat, uniform look. They allow you to keep your set of wall plates intact without the need of trying to find a matching cover in a new size. Their small size also minimizes the amount of device color showing, so when paired with decorative wallplates that are not the standard colors, these will blend in better and be less noticeable. 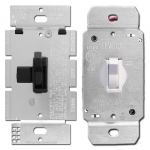 A classic electrical device that has been popular for decades, twist dimming devices conveniently fit into a toggle plate opening (the knob covers the rectangular opening) while making it obvious that it is capable of adjusting the lighting intensity. This is an advantage when you have frequent guests or simply want to know at a glance which switch is dimmable. You may also prefer the smooth control that a rheostat button provides. The larger knob is easier to adjust to a finer lighting level than a tiny preset lever for those with less finger flexibility. 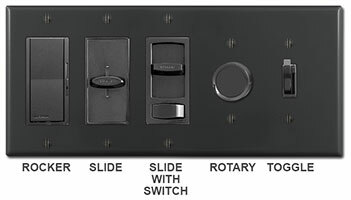 In addition, Kyle Switch Plate offers rotary knobs in a wide range of colors and finishes (brass, bronze, chrome, copper, etc.) with both plain and decorative versions for an elegant accent that will coordinate with metal faceplate covers. The newer universal dimming switches are designed for use with both incandescent and halogen light bulbs, plus work with the recently developed dimmable light-emitting diode and compact fluorescent bulbs. These environmentally friendly bulbs help you save money on your energy bills. 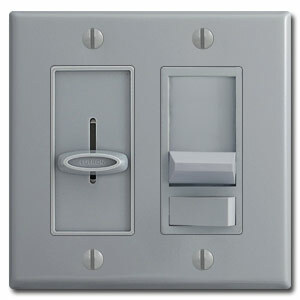 For modern fixtures, Lutron Diva dimmable paddle devices for CFL and LED lights have sliding adjusters which can be either a small lever on the side or a wide knob that moves up and down, sometimes above a switch. This type of universal switch dims incandescent and halogen light bulbs in addition to dimmable light-emitting diode and compact fluorescent bulbs. 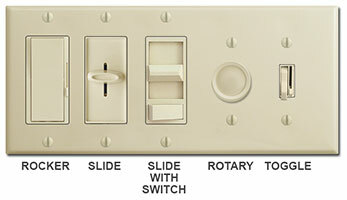 Lutron Diva switch can be wired as a 3-way or single-pole. Fits in a rocker switch plate. If you enjoy your modern conveniences but appreciate vintage style, consider adding a pushbutton type for controlling lighting levels. 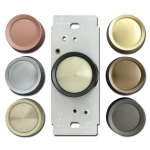 These updated push-button dimming switches are available in single-pole or three-way versions and are UL approved. 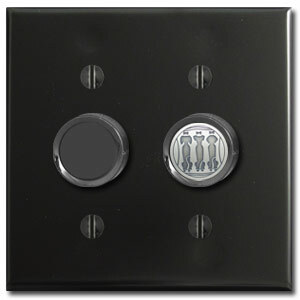 They fit antique reproduction push button light plates and are sure to be conversation starters. Kyle Switch Plates offers many configurations so it's easy to find the sizes and finishes that will allow you to attractively add vintage charm to your home. For more information and your range of choices, please see push button light dimmers. Looking for an easy way to dim the a floor lamp or table lamp without any wiring? 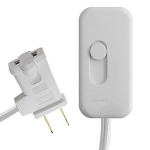 This plug-and-use lamp dimmer switch is an easy solution for apartments and nurseries. 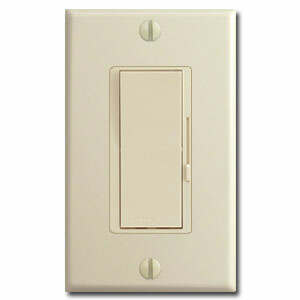 Lamp dimmers are available in white and black and offer flexibility since they can be moved around the house as needed. This portable plug in dimmer switch works with 100W CFL, 100W LED and 250W incandescent/halogen bulbs. Fresh and bright, you can never go wrong with white switches for adding a clean, updated look to your home. As a result, you'll find the widest variety of controllers in white - rocker with a preset lever, slider, slide with an on/off switch, rotary, and toggle (with or without presets). 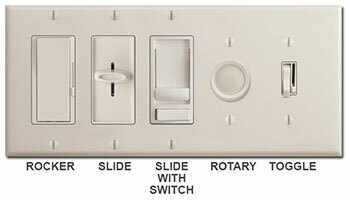 Shop all white dimmer light controls. A traditional favorite for its creamy color that coordinates well with natural materials like wood, cotton, jute, and wicker. It looks especially nice with neutral-colored wall paint and furnishings. Shop all ivory dimmers. For a less yellow look, almond is another option. 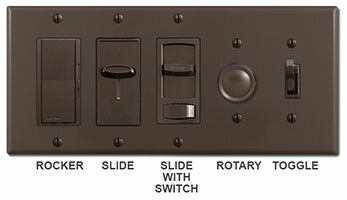 There are fewer styles available with choices being rocker, rotary and toggle. Shop almond light controllers. Gray is a popular choice in rooms when paired with aluminum and stainless steel switch plates, nickel fixtures, and chrome hardware. 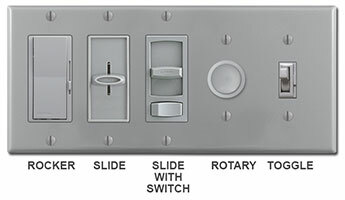 Shop all gray dimmer switches including gray and silvery units. The natural choice for black wall plates, these controls can be used to dramatic effect with stainless covers set against black granite, or with white switch plates in black and white kitchens to continue the checkerboard pattern of tiled floors. Shop all black dimmers. A classic favorite, brown wall plates come in a variety of sizes and so do the matching devices. Because of its rich coloring, brown looks especially attractive with bronze and brass cover plates, too. Shop all brown light dimmer units. 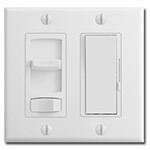 Can I install a 3-way dimmer as a single pole? Yes, most any regular three-way devices can be wired to control a single light just by capping off the red wire. Can I put two or more dimmable switches next to each other? Yes, generally you can. Please note, however, that certain brands and styles may have wide flanges around the device to dissipate heat. These fins would have to be trimmed at the break-off points on whatever side is next to another dimmer (either one or both sides). When this is done, the device is derated to carry a lower load - check your device installation information to see what the de-rating levels are when one or both fins are removed. Will dimming lights save money? Yes. When you set your lights to a lower level, not only will you reduce the power that the lights draw, but your home will remain cooler thereby allowing you to minimize your A/C usage. Both will directly save you money on your energy bills. I want to keep my toggle switch plate that matches my set - what are my choices? Choose either the toggle style (with or without preset levers) or a rotary one. 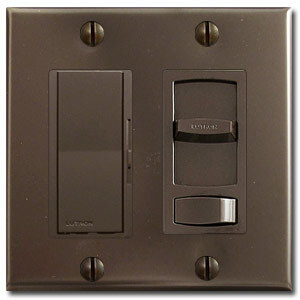 Note that if you choose rotary, Kyle Switch Plates has decorative knobs that can add a creative touch to your decor. Is there a dimmer that would fit a duplex opening? No. 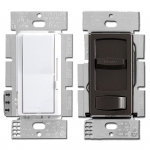 If your current wall plate has a duplex opening (two rounded openings with a single screw in the middle), then we recommend getting a new plate or swapping out the devices and covers from another location where you could use either a toggle or slider type instead.